Optimization models based on a nonlinear systems description often possess multiple local optima. 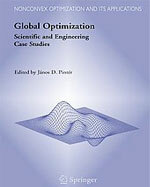 The objective of global optimization (GO) is to find the best possible solution of multiextremal problems. This volume illustrates the applicability of GO modeling techniques and solution strategies to real-world problems. The contributed chapters cover a broad range of applications from agroecosystem management, assembly line design, bioinformatics, biophysics, black box systems optimization, cellular mobile network design, chemical process optimization, chemical product design, composite structure design, computational modeling of atomic and molecular structures, controller design for induction motors, electrical engineering design, feeding strategies in animal husbandry, the inverse position problem in kinematics, laser design, learning in neural nets, mechanical engineering design, numerical solution of equations, radiotherapy planning, robot design, and satellite data analysis.